Sun Earth is a Chinese company established in 1966 and it has now acquired a multinational profile thanks to its presence in Asia, Europe, and the U.S. In 2010, the company opened its Australian office in Melbourne, in order to cover the increasing demand coming from our market. As of now, Sun-earth manufacturing lines have an overall production capacity of almost 1GW per year; this led the company becoming the major supplier sourcing solar energy solutions to the vast majority of telecommunications plants in China. Sun Earth’s production chain can count on four different facilities to produce solar wafers, ingots, polysilicon, modules and cells including also off-grid solutions for military applications, street lightning, photovoltaic systems for rural locations, as well as back-up power systems for telecommunications, traffic and railroads systems and oil field applications. 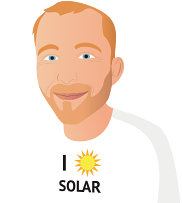 If you want to learn more about Sun-Earth line-up of photovoltaic products, make sure you browse the reviews here below from customers who bought their solar panels in the past, or have a look at the photovoltaic systems listed on this page to find the ones that best fit your requirements and needs. Solar instal of 12 x 250 watt panels with a 3 kw inverter at Mornington Peninsula residence. Ist year of installation generated 4224 kwh. 2nd year of installation generated 4018 kwh. Probably need a clean sfter 14 months although we will likely wait until after the wet season in SE Qld.